A representation of Canary Wharf Crossrail station. BIM is being used in an ever increasing array of projects. What is a BIM Manager, and how does this relate to civil engineering? A BIM Manager is a civil engineer who is responsible for the implementation of Building Information Modelling (BIM) and the Digital Construction procedures at the design, construction and handover stages of a project. A BIM Manager’s role and responsibilities may vary depending on whether the individual is working for the client, contractor or designer. A BIM Manager has a unique opportunity to have a wide and varied exposure to all elements of the construction process. On a day to day basis a BIM Manager may work with Quantity Surveyors, Designers, Planners and Engineers to assist in the manipulation and extraction of information from data-rich models. There is a common misconception about the simplicity of BIM, some people believe it’s just 3D models and “Hollywood Style” visualisations. In actual fact BIM is a process-driven discipline which results in “Better Information Management”, achieving a more effective and collaborative workplace. macro and micro 4D (3D models with time) simulations for live projects and tenders, to assist project planners. model quantity take-offs to assist quantity surveyors, estimators and planners. the processing of point cloud information to assist and prove construction sequences and the extraction of exact dimensions. The creation of Employers Information Requirements (EIRs). The EIR document explains the client’s preferred systems, processes and required outputs from their supply chain. The set up and maintenance of the Common Data Environment including the alignment of workflows with the project BIM protocols. In summary, the role of BIM manager gives a civil engineer the ability to combine innovative technology, evolving construction practice and better collaborative processes in one unique position. BIM is a new concept, albeit using and reiterating common sense and good practice and collaboration, just like good engineering always used to use. The Government is enforcing the use of BIM Level 2 on all Government procured projects as of 6 April 2016. To win these tenders, companies must be BIM compliant. A BIM toolkit will be published in 2015. For more information, see the Building Information Modelling (BIM) Protocol. How do I become a BIM Manager? While there is not currently a recognised route to the BIM Manager job role there are certain minimum requirements expressed by a large number of employers. A BIM Manager is often expected to have academic qualifications of HNC/HND (or higher) in a construction-based subject such as civil engineering, additionally they should have at least 5 years’ experience in an architectural, engineering or construction-based role. It is common for individuals with CAD, Document Control or engineering backgrounds to make the transition into a BIM-based role. While a BIM manager will not have any design responsibilities, they should have a basic understanding of the modelling process. BIM Managers are expected to have above average IT skills and the ability to use multiple software disciplines as they will be expected to “drive” the model during meetings. Good written and verbal communication skills are a must as BIM Managers are expected to work collaboratively with all members of the supply chain. A sound knowledge of quality and document management processes is extremely useful as BIM Managers may be expected to assist with the creation and maintenance of Common Data Environments (CDE’s). There is currently no formal industry recognised qualifications for BIM so as such any individual with a civil engineering background and a passion for BIM can make the transition. Paths into the profession and job role requirements will differ between companies. In practicality, this will mean learning to use the software used by the company involved in the project, and then conversations about how to create and use this data. This could mean the planning software to determine how to build a factory, the quantity surveying software used to determine its costs, the asset management software to lower costs during the factory’s operational stage, or the public facing user interface that mines all these for information. How can I learn more about the discipline of BIM? 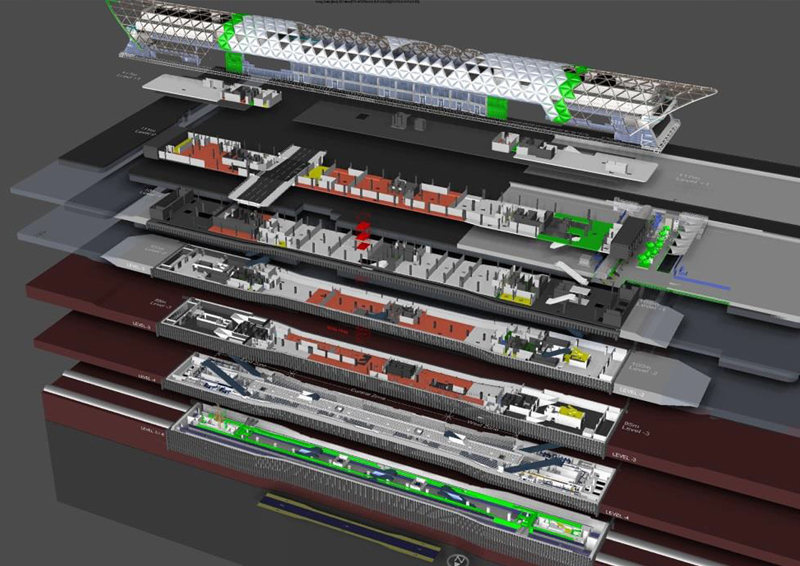 Modelling Canary Wharf station - This case study explores how 4D modelling has been used to understand the complexities of the new station being constructed at Canary Wharf. Express Rail Link West Kowloon terminus building - To symbolise the growing relationship between Hong Kong and China, the world’s largest rail network is being built to connect Hong Kong and Beijing. Contractors have made extensive use of Building Information Modelling (BIM) throughout the project's lifecycle. BIM Task Group | A UK Government Initiative - This site contains a wealth of information about the roll out of BIM Level 2, Level 3 and beyond. ICE offers training on ICE BIM for Infrastructure, from experienced practitioners such as Philip Jackson, BSc (Hons), CEng, FICE, FRSA, Richard Lane FLPI, MBCS and Anne Kemp, Chair, Association for Geographic Information, BIM4Infrastructure UK and ICE BIM Action Group. This is the UK's leading BIM training programme. The two day syllabus embeds the Government's Learning Outcomes Framework and takes the delegate through each aspect of BIM in detail: data, application, contractual and insurance. This is highly relevant for those hoping to become BIM managers.